To find out what type of information a report includes before you create the report or to preview a report, choose Reports→Reports & Graphs Center. The transactions you enter in the transaction list window or a transaction form and the checks you enter in the Write Checks window determine the information in a report. You can change the report date or date range by using the box(es) provided. 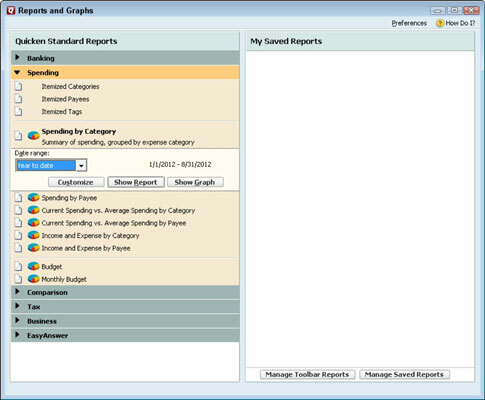 Click the Show Report button to create the report. If you don’t enter a new range of dates, Quicken assumes that you want to include transactions from the start of the current calendar year through the present date. Reports that show account balances — such as the Account Balances report, the Net Worth report, the Balance Sheet report, or the Portfolio Value report — don’t need a range of dates because these reports show account balances as of a specific date. In these cases, if you don’t enter a date, Quicken assumes that you want account balances for the current system date from your computer’s internal clock. You can’t see the entire on-screen version of a report unless your report is very small (or your screen is monstrously large). Press the PgUp and PgDn keys to scroll up and down and use Tab and Shift+Tab to move right and left. Or if you’re a mouse lover, you can click and drag various pieces of the scroll bars.